2014 for me has been a special year. I have learnt a lot and been involved in some amazing things with some amazing people. I have done a review of 2014 in pictures; if I've got a picture of you then you are probably in there, so look closely! Not surprising that my year really did start and finish with Hen Harriers. I wish everybody and our wildlife all the very best for 2015. At the start of the weekend I was delighted to be driving down to the Hayes Conference Centre in Swanwick, and as you can guess in the title of my blog, it was indeed the annual BTO conference, and my visit ever visit to it. It was a long drive down in horrendous traffic and even a sprinkle of snow, however despite the tricky drive across I was delighted to arrive and be greeted by all my young friends that I speak with on line, including Toby Carter, Ben Moyes, Josie Hewitt, Evie & Abby Miller and Ellis Lucas. The first evening of the weekend started with a talk by Helen MacDonald who wrote H is for Hawk. Her talk was very interesting and there was lots of interesting information and even some bits I didn't agree with; but I think a presentation is good if it makes you think or question things. Then it was off to the quiz with my young friends. Our team easily beat the parents team (and Hugh Brazier) but we didn't win the overall thing. Nick Moran was really funny doing the quiz. During the quiz we also got to know Gethin, a 15 year old birder who I hope to see again. After a great evening catching up with people and some sleep, Saturday morning started with a crisp but refreshing frost. It was brilliant to listen to all the exceptional talks presented by some fascinating people, including first a brilliant talk all about wind farms located in the sea, and their affects on sea birds and other off shore wildlife. They also talked about what groups and the government could do to reduce the amount of deaths per year (especially the most affected higher flying species of bird including gulls, compared to the likes of shear-waters which fly closer to the water and to the shore). It was great to listen to the talk based on the correlation between birds and climate change, giving some brilliant explanations and points on how the weather affects breeding birds and the amount of migrants and immigrants that visit year after year to the United Kingdom. I'd also like to pick up on Kevin Gaston's fascinating talk to do with birds in an urbanising world. The talk was so captivating and I am still thinking about the things he said days later. He also talked about the nature related words that have been removed from the Children's Oxford dictionary, words like Acorn,Buttercup,Kingfisher,Starling to name a few ... But then he talked about new words added in to the dictionary......Endangered and Celebrity ! It's scary isn't it. Another great talk I'd like to mention was one by the extraordinary Dave Leech, not just because he is so inspiring but also because he is a great, knowledgeable man. Now I'm sure you can guess what his talk was on (not rock music), it was nesting of course, showing all about the number of nest records sent in to the nunnery. It included the most frequent and obscure nests and it was also really nice to see he had used some of the youngster's nest pictures, including my Blackbird nest. Kate Plummer's talk was based upon how our Blackcaps used to be mainly Summer migrants but how more are also wintering here in the UK. This talk was full of information, including why Blackcaps are wintering, to do with the fact of Climate Change and how our Winters are getting warmer, and how wintering Blackcaps have evolved in a short space of time (especially their beaks) to feed on our garden feeders like fat balls and sunflower hearts. One of the best graphics I saw was one shown by Viola Ross-Smith which showed a flight of a Lesser Black Backed Gull from it's satellite tag. You could even see where it had followed a plough. You can watch this clip here, look out for the bit when it rises on the thermals, it's just brilliant. 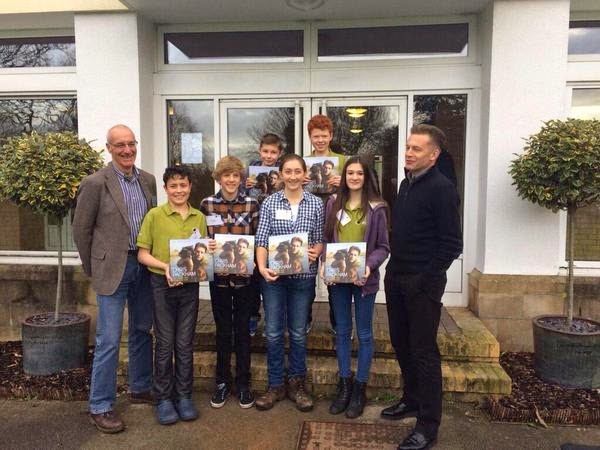 On the Saturday the young birders were invited to have lunch with Chris Packham and Andy Clements. It was a great lunch with lots discussion about getting the BTO engaged with younger people. We were all given a signed copy of Chris Packham's book (100 things that caught my eye) which was very generous, thank you again Chris and of course you Andy for all the support you have given me and my friends. After a Brilliant lunch, it was time to listen to couple more talks, the first of which was called Urban Peregrines. This one caught my eye because it was about the fact that Peregrines have increased in our Urban areas like cities. This talk was also about how they have distributed throughout the UK and about how the BTO and colour ringing are helping to track and learn about the science of these fascinating birds. I'd like to point out how a couple of the talks and conversations proved how important things like ringing and nest recording are exciting, fascinating and inspiring for getting children engaged and involved with citizen science and the natural world. Ringing and nest recording are the sorts of hands on activities that grab children's attention and spark an interest straight away. After a delicious tea, and great nights sleep I was delighted to wake up on Sunday and find it was the day of the Young Birders. Today we were taking to the stage. I was going to deliver part of my passion, and talk about how we can help nature and what we have done to bird populations. Of course I was nervous about speaking in front of 350 or so ringers, nesters, birders, scientists, experts and important members of the BTO. I think we were all nervous and couldn't stop worrying about whether it would go well or not, however knowing that I knew my words and believing in my words, I felt like it was going to be OK. I was speaking last, and I don't know if this is better or worse than going first, but the great talks I heard from my friends held my attention and stopped me thinking about my turn. Before we all began speaking we were formally and informally introduced by Lucy McRoberts (Head of A Focus On Nature) who first spoke a bit of why we were there and her interests in engaging the youngsters. Lucy has done so much to get young people involved and I will always be grateful for her time and support. First up it was Ben Moyes who delivered a brilliant talk about his birding patch. He also talked about the water coloured cards he has just got printed from his paintings (we bought some of them). Second up it was Josie Hewitt who again gave a brilliant talk on her ringing and just getting her C-permit. After that it was Toby Carter, who also delivered a great speech on what birding activities he gets up to and a bit about his ringing. Next it was then onto Ellis's talk (who has never spoken to a big audience before), but he was brilliant and made everyone laugh in a good way. He talked about all the nest recording he does (great job on that Whinchat Ellis). Then it was on to Evie Miller's talk about how she first developed an interested and also a bit on her ringing. They were all such great talks, that I was getting even more nervous. And now it was my turn to step and be heard. I spoke about how I got interested in the natural world, but I mostly talked about the declines in nature and how we all need to work together to turn this round. My slides in the background started with a murmuration of about 20,000 Starlings and gradually reduced until the last slide had just one Starling. The slides represented how quick extinction can happen if we do nothing. But I also talked about hope and how working together can change things. I finished with a verse from a poem which is about hope, but I will finish this blog on that. We all are and always will be students of the natural world, so young or old, let’s learn and share together.